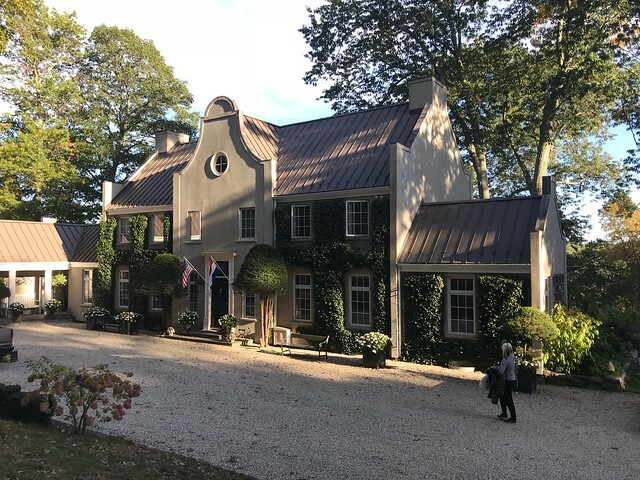 When we were planning the trip, we spent some energy trying to figure out how to get from the Hidden Valley Bed & Breakfast in Connecticut to Washington DC for parent weekend. The flight and train options were expensive. By the time, you figured in dropping the rental car, catching the plane or train and then getting to the hotel, it would take almost as long as driving. We ended up deciding to drive the 320 miles. Up at 6:00 am, we loaded up the car and were on the road before 6:45 am. Waze took us south across the northern tip of Manhattan, along the Jersey Turnpike past Philadelphia and through Baltimore. With two quick stops, it ended up taking about 6 hours and 45 minutes. I dropped Sharon and the 130 pounds of luggage at the Georgetown Marriott. We are spending two night here on points. I then dropped the car at Hertz in the Washington Hilton. Less than a mile walk from the Georgetown Marriott, this worked out reasonably well as a place to drop the car. I would pick up or drop a Hertz car here again. After I walked back to the Marriott, Sharon and I had a heavy snack at the bar. From there, we walked into Georgetown. Sharon did a little shopping on the way. Eventually, we got on to campus, picked up our parent weekend package and met up with Jack. The three of us caught an Uber back to the Marriott and spent some time in the room visiting and catching up. After struggling socially his freshman year, Jack is settling to his sophomore year much better. He has a job with the Corp at Uncommon Grounds, has been working out with the climbing club and has joined the Knights of Columbus. The three of us finished the night with dinner at Kaz Sushi Bistro. The food was fine, but nowhere as good as Mikuni's... Jack took an Uber back to campus.